Although historically not a target country for wealthy individuals, Portugal has implemented structural reforms in recent years that have made the country one of the best all-round jurisdictions for high net worth individuals to relocate to. Much of this success is down to the special programmes introduced to attract individual investors – the Golden Residence Permit Regime (allowing for free movement within the Schengen and the possibility to apply for Portuguese nationality) and the Special Tax Regime for Non-Habitual Residents – and the absence of wealth tax, gift and inheritance taxation on transfers between spouses, descendants or ascendants, exit tax, free remittance of funds and international trends (e.g., increase of fiscal pressure in some specific countries, tightening of access to traditional target countries, new global standards on automatic exchange of information). In addition, there is, of course, the reduced cost of living, public safety, healthcare system and climate, among other factors. Recent progress in defining the tax regime applicable to the trusts and other fiduciary structures (a grey area until recently), also contributed to placing the country on the map of private wealth planning and foreign trust owners. has at his or her own disposal a dwelling place in such conditions that it may be inferred that there is the intention to keep and occupy it as a habitual abode. Portuguese tax residents are subject to IRS on their worldwide income, on an unlimited liability basis. Non-resident individuals are subject to tax on the income obtained within Portuguese territory. For IRS purposes, income is divided into six categories: A (employment income); B (business and professional income); E (investment income); F (real estate income); G (capital gains); and H (pensions). Employment income, business and professional income capital gains from the sale of property and pensions are subject to a progressive income tax rate of up to 48 per cent. A surcharge applies to the part of the income exceeding €80,000, as follows: 2.5 per cent on the part of income exceeding €80,000 and up to €250,000; and 5 per cent on the part of income exceeding €250,000. Investment income (such as dividends, royalties and interests), real estate income and capital gains derived from the disposal of securities (such as shares, bonds, etc.) are subject to taxation at an autonomous final rate of 28 per cent. income regarding insurance policies, life assurance policies and pension funds schemes may be partially excluded from taxation whenever the amount of premiums, sums or contributions paid in the first half of the term of the contracts represents at least 35 per cent of the total. With the aim of attracting high net worth professionals, entrepreneurs and pensioners, Portugal has implemented an attractive tax regime for foreign individuals who wish to establish permanent or temporary residence in Portugal: the Non-Habitual Residents Tax Regime (NHR). The major advantage of the NHR, and the one that makes it extremely attractive compared with similar regimes adopted in other European countries, consists of the introduction of a 10-year period during which Portuguese-source income received by individuals developing a high value-added activity is subject to a reduced flat tax rate, and foreign-source income, namely pensions, capital gains or business profits, may be fully exempt from tax, irrespective of remittance. Employment income: the exemption will apply to foreign-source income if this is taxed in the source state in accordance with a double tax treaty entered into between Portugal and that state, or, if no tax treaty has been entered into between both states, the income is taxed in the source state and is not considered to arise in Portuguese territory according to the domestic criteria. Profits, interest, income from immovable property, capital gains, business and professional income arising from high value-added activities that are of a scientific, artistic or technical nature, and royalties: the exemption will apply if the income or gains can be subject to tax in the other state under a tax treaty entered into between Portugal and that state. Alternatively, if no tax treaty has been entered into between Portugal and the source state, the exemption applies if, pursuant to the rules of the Organisation for Economic Co-operation and Development (OECD) Model Tax Convention, interpreted in accordance with Portugal's observations and reservations, the income or gains can be taxed in the source state, and provided that the income is not deemed to be sourced either in a blacklisted jurisdiction or in Portugal. Pensions: the exemption will apply if the foreign-source pension income is subject to tax in the source state in accordance with a tax treaty entered into between Portugal and that state or, alternatively, if the income is not considered to arise in Portuguese territory. Under this provision, both public and private pensions (other than pensions for public service) may benefit from total exemption from tax. This means that such pensions will not be subject to tax either in Portugal or in their state of origin in relation to a number of jurisdictions, including, for example, Austria, Belgium, China, Finland, France, Germany, Russia, Sweden and the United Kingdom. In some other states, this provision may grant a total exemption for private pensions only. is able to present a foreign certificate of residence establishing that he or she has been subject to effective taxation abroad prior to his or her arrival in Portugal. The tax rate levied on gifts and inheritance is 10 per cent. A surcharge of 0.8 per cent of the taxable property value may be imposed on gifts or inheritance as far as they consist of real estate located within Portuguese territory. However, there is no taxation on gifts or inheritance on assets not physically or legally located in Portugal at the time of death or donation, or transfers in favour of a spouse, descendants or ascendants. There is no wealth tax in Portugal. However, the identification number of bank accounts held abroad must be disclosed in the annual income tax return. The property transfer tax is levied on the onerous transfer of immovable property. The tax is payable by the acquirer, whether individual or company, resident or non-resident. The taxable amount corresponds to the higher of the contracted value or the tax patrimonial value. rural or urban property when the acquirer is domiciled in a blacklisted jurisdiction – 10 per cent. Local property tax is levied annually on immovable property located within each municipality. The tax is payable on the taxable value by the owner of the property as of 31 December of each year, to be paid in two instalments in the following year. The taxable value of urban property corresponds to the tax patrimonial value inscribed in the tax registry and is determined by reference to correcting coefficients. rural or urban property when the owner is domiciled in a blacklisted jurisdiction – 7.5 per cent. The addition to IMI is levied on urban properties for dwelling purposes owned by individuals or companies, but individuals will not be taxed if the taxable value of its properties does not exceed €600,000. The tax rate is of 0.4 per cent in cases of properties owned by companies and 0.7 per cent for properties owned by individuals (increased to 1 per cent for the amount of taxable value exceeding €1 million). In contrast to this measure, the stamp duty levied on residential property with a taxable value higher than €1 million has been abolished. if paid to the beneficiary or beneficiaries, deemed as transfer for free (donation or inheritance) subject to stamp duty (flat rate of 10 per cent), even if, according to the territoriality principle laid down in the Stamp Duty Code, only the assets located within the Portuguese territory would be subject to tax. CFC rules were introduced in the 1990s, aiming to combat international tax evasion, notably by means of accumulation of profits in low-taxation territories. Basically, CFC rules provide for the inclusion, in the taxable income of the resident companies and individuals that control foreign legal entities deemed domiciled in a blacklisted jurisdiction, of the undistributed passive income received by such entities. A relevant control shall be deemed to exist where the Portuguese-resident taxpayer holds, either directly or indirectly, a corporate interest equal to or exceeding 25 per cent of the shares, voting rights or equity rights of the foreign entity or its financial assets, albeit via an agent, nominee, trustee or other intermediary. In addition to Portuguese domestic arrangements that provide relief from international double taxation, Portugal has entered into double taxation treaties with 79 countries to prevent double taxation, 76 of which are already in force. Under these treaties, withholding tax rates on outbound dividend, interest and royalty payments are reduced wherever the beneficial owner of the income derived from Portugal is a tax resident of the other contracting state. Portugal is a signatory to the Multilateral Convention to Implement Tax Treaty Related Measures to Prevent Base Erosion and Profit Shifting, the implementation of which may impact on the application of the existing double taxation treaties. Law 82-B/2014 of 31 December 2014, which enacted the Portuguese budget law for 2015, approved a special financial information reporting regime, aimed at establishing the terms of the information exchange under the Foreign Account Tax Compliance Act (FATCA) agreement between the Portuguese and US tax authorities, including identification of the reporting entities, definition of reportable accounts, due diligence process for reportable accounts, information to be reported, timetable for reporting and penalties for non-compliance with the required information. On 6 August 2015, Portugal and the United States concluded an agreement to improve international tax compliance and implement FATCA, which entered into force on 10 August 2016, after the fulfilment of its constitutional requirements. Portuguese succession laws have remained fairly unchanged over the years, partly owing to cultural reasons, as succession is deemed a right of the family members of the deceased in respect of a continuum principle (where possession is retained by the family). As in most civil law jurisdictions, the Portuguese succession legal framework is complex and characterised by strong limits to the right of free disposition mortis causa of one's property. Effectively, Portuguese succession law stipulates a forced heirship regime to protect the spouse, descendants and ascendants, ensuring these heirs from a third to two-thirds of the deceased's total assets. The portion of the inheritance (deceased's estate) that is reserved for the legal heirs is generally safeguarded and cannot be affected by will or even (in most cases) by donations prior to death, as the assets could be reintegrated in the inheritance. A distinctive feature about Portuguese succession is that the Portuguese regime only applies if Portuguese law is considered to be the personal law of the deceased at the time of death or will, independent of the location of the assets comprising the inheritance, both movable and immovable (universal succession). For this purpose, Portuguese private international law stipulates that the deceased's personal law is considered to be the law of his or her nationality at the time of death or at the time of the celebration of the will, being of utmost relevance for the determination of the law applicable to the succession and all its regulatory aspects of distribution and administration of the assets comprising the inheritance, and for the determination of the capacity for and the interpretation of the will. As mentioned before, the Portuguese succession regime did not keep pace with regulation and social changes related to marital status, being largely irrelevant for succession purposes, de facto unions or civil partnerships and matrimonial property schemes adopted or prenuptial agreements, as none of these situations can affect the reserved portion or change the hierarchy of heirship. The Portuguese Socialist Party recently presented to Parliament a draft law whereby a spouse married under the regime of separation of property may validly waive his or her capacity of heir to protect children of earlier marriages. This legislative initiative has been seen by large parts of civil society as the starting point for a wide-ranging debate about the dogmas surrounding succession issues. Further developments are expected to occur. In Portugal, the most common forms of will are the public will (which is drawn up by a notary and archived in the notary's books, although remaining strictly confidential) and the private will (which is handwritten by the testator and its conformity with form requirements is then verified by a notary who issues the validation instrument). Any of the said wills are freely revoked, with special requirements applicable to the public will, which need to be done by a public (i.e., not confidential) deed. the jurisdiction to which the local conflict-of-law rules refer. Although not as common as any of the said wills, it is also possible to conclude an international will, according to the Convention providing a Uniform Law on the Form of an International Will, concluded in Washington, DC on 26 October 1973. Finally, according to Portuguese law – and as far as it is the applicable law – it is important to note the disposition by will of the deceased's assets as the limit stated regarding the rights and the reserved portion of the inheritance of the legal heirs. The Portuguese succession regime is still very strict, leaving little room for the legal possibilities of estate planning. 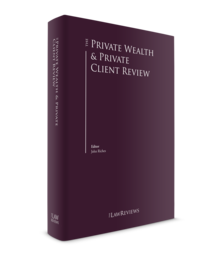 In addition, as most transfers on death are exempt from inheritance tax, and taxes levied on wealth are nearly non-existent in Portugal, no advance tax planning is necessary in most cases. That being said, there are still some situations that may justify the structure of some legal entities (as private limited corporations or public limited companies) or civil entities. In some cases, and for some specific and mostly altruistic purposes, it could also be justified to create a foundation, although in this case the creation and the activity of the foundation is subject to administrative approval and regulation. Following the transposition of Directive (EU) 2015/849, Portugal has introduced a central register of beneficial owners, under which the individual person or persons who, whether directly or through a third party, own or effectively control entities with legal personality subject to Portuguese or foreign law, and who conduct activities or carry out acts or legal business dealings in Portugal, must be disclosed. Entities subject to the register include associations, cooperatives, civil societies and commercial companies trusts, and other fiduciary structures. to qualify the income arising from the distributions, liquidation, revocation or termination of the trust. One consequence of this legal vacuum is that a Portuguese settlor who sets up a trust must respect Portuguese mandatory heirship rules. Any infringement of these rules can be challenged by the heirs of the settlor, and the assets transferred to the trust may be reduced accordingly. only two-fifths of the income received is subject to personal income tax (meaning an effective tax rate of 11.2 per cent) if the payments are made under contracts that have been in force for more than eight years. As a result of the tax reforms and programmes undertaken over the past few years, and other factors relating to economic, social and lifestyle aspects, Portugal is currently an extremely appealing country for wealthy individuals to have a foothold in, competing in this respect with other countries traditionally chosen for wealth-planning purposes. The NHR, along with the visa programmes, represented a major step forward, allowing for those who become tax resident in Portugal and are accepted as non-habitual residents the opportunity to receive qualifying income tax-free, both in Portugal and in the country of source under proper planning. From a macroeconomic perspective, GDP growth is expected to ease slightly but should remain strong in 2018 and 2019 (at around 2 per cent), mostly supported by employment and consumption growth, inbound investment and favourable external trade conditions. Despite some recent developments in the composition of the government (whose effects were felt in the increase of the taxation of land and real estate), the political situation remains stable and there is not expected to be any relevant shift in the commitment of the main political forces to ongoing reforms of the tax and labour regimes, and to the strengthening of the current path of growth. 1 José Pedroso de Melo is a managing associate at SRS Advogados.